District 207 named one of the “Most Innovative School Districts” in U.S.
District 207 was one of 25 school districts in the U.S. in 2018 to be honored as one of the “Most Innovative School Districts” for its unique approaches to expand and support teacher learning and student success both during and after high school. 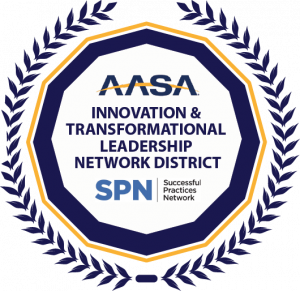 The award was provided by AASA (The School Superintendents Association) and the Successful Practices Network (SPN). A case study written by AASA provides in-depth insights into District 207’s innovation in attracting and maintaining high quality educators, creating a unique in the country personalized coaching program for teachers, fostering teacher innovation and risk taking, and personalized learning for studentsm which may be found here. Only 182 Illinois high schools made the news magazine’s 2018 list of “Best High Schools.” Maine East and West were among them. US News utilizes a 4-step process involving graduate rates, college readiness, exam performance compared to statistical expectations and the relative test performance of disadvantaged students. Washington Post education columnist and blogger Jay Mathews utilizes this formula: He divides the number of Advanced Placement, International Baccalaureate and Advanced International Certificate of Education tests given at a school each year by the number of seniors who graduated that year. Mathews reasons that the extent to which a school challenges its students is best indicated by the number of students taking advanced courses and exams. Any result of 1.0 or higher earns a school a place on the list. Nationally, only about 10 percent of schools meet that mark. Maine East had an index this year of 2.27. Maine South had an index of 2.18, and Maine West 1.64. In Illinois, only 71 of more than 750 high schools made the Post’s list; among Illinois schools, Maine East is ranked 35th, Maine South 40th, and Maine West 59th. Innovation in technology has again placed Maine Township High School District 207 in select company, as Tech Insider has named the District’s three schools, collectively, to its list of “The 14 Most Innovative Schools in America.” Additional details may be found here. In 2007, under the direction of current Superintendent Dr. Ken Wallace and Dr. Hank Thiele, previously Assistant Superintendent for Technology & Learning, District 207 reached out to Google and became Google’s first elementary and secondary school district Google Apps for Education partner. Today, as a result of that vision, G Suite for Education, the modern version of Google Apps, is used by millions of students and teachers. In District 207, having work available from any Internet-connected device in Google Drive, being able to simultaneously collaborate in G Suite, and the accessibility and affordability of Chromebooks continues to change learning on a daily basis for students and teachers. Google has identified 10 high-performing districts from around the world and studied the processes and attributes that have led to their success. Maine Township High School District 207 is one of those districts and is featured here on Google’s new Education Impact portraits, which may be found here. Maine Township High School District 207 was among only 11 districts in the country to receive a 2015 Digital Content and Curriculum Achievement Award. The Center for Digital Education established this awards program to recognize schools for their innovation and diligence in digital content and curriculum program implementation. Believing that Illinois high school students deserve enhanced opportunities to learn and practice civic engagement, the Illinois Civic Mission Coalition created a process by which high schools affirm their commitment to civic learning by seeking recognition as a Democracy School. High schools are recognized for consciously promoting civic engagement for all students by all teachers. There is an intentional focus on fostering participatory citizenship and placing an emphasis on helping students understand how the fundamental ideals and principles of our democratic society relate to important current problems, opportunities and controversies. Since 2006, just 74 high schools have been recognized.